Sporkova Street leads to the most bizarre corner of the Little Quarter, which originally had formed a separate settlement called Deer-Park. 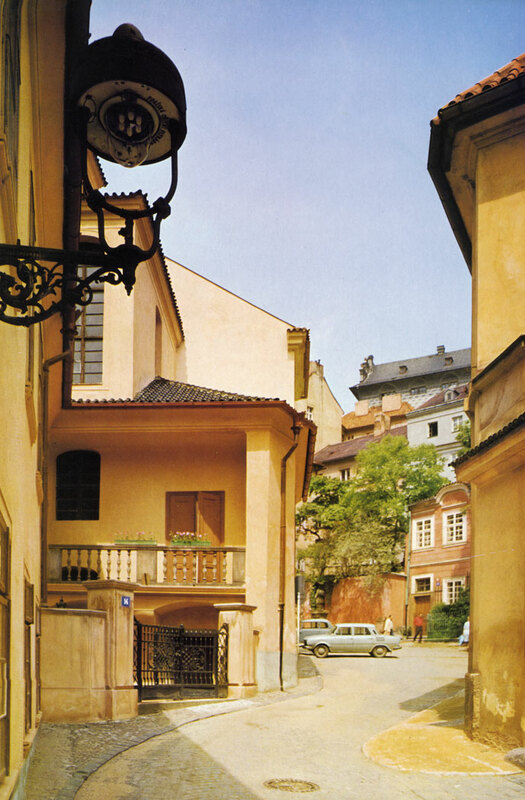 At the entrance to Italian Street (Vlasska ulice) stands the Italian Hospital, built after 1602 by a charitable organization of Italian settlers in Prague called the Italian Con­gregation. The Hospital closed down in 1783. Today it is the seat of the Institute of Italian Culture. 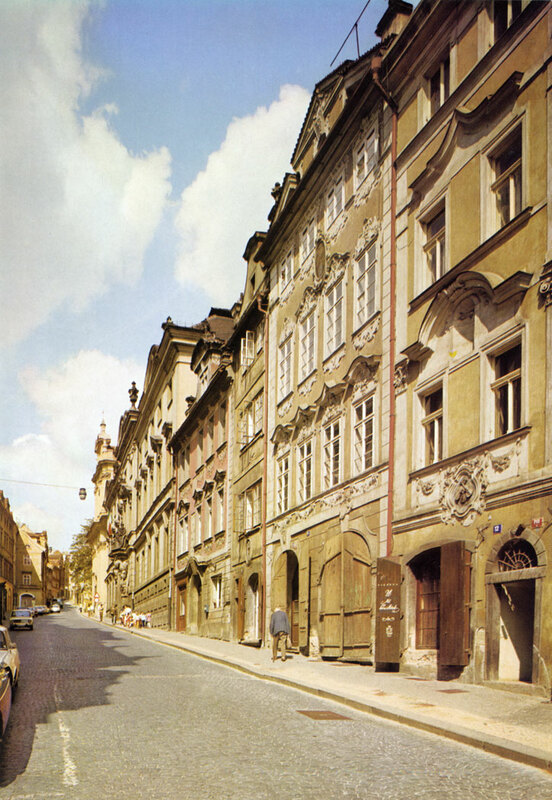 Neruda Street has kept its eighteenth century charac­ter to the present day, both in the predominance of High Baroque in the house fronts, house-signs and portals and in the optical symmetry of buildings typical of Prague Baroque. The house At the Golden Swan (dum U zlate labute) was built by 0. Aostalis in Renaissance style in 1589. 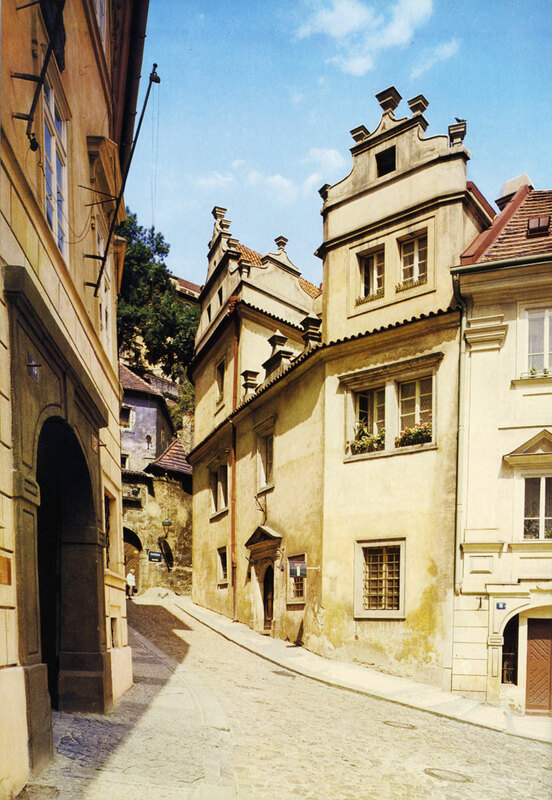 Snemovni Street narrows here into a blind alley, At the Golden Well (U zlate studne), named after the house with a restaurant renowned for the magnificent view it affords over the city. 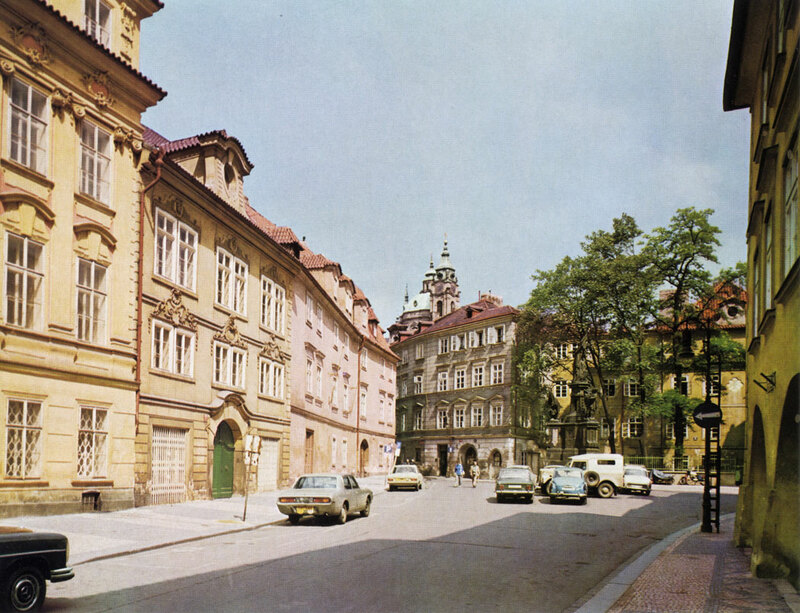 The area of the Thunovska and Snemovni Streets used to be densely settled before the foundation of the Lesser Town of Prague in 1257. Its present net­work of streets is due to the old Gothic building lots, on the one hand, and the Renaissance and Baroque palaces, on the other. Maltese Square (Maltezske namesti) belonged to the marginal property of the Order of St. John. 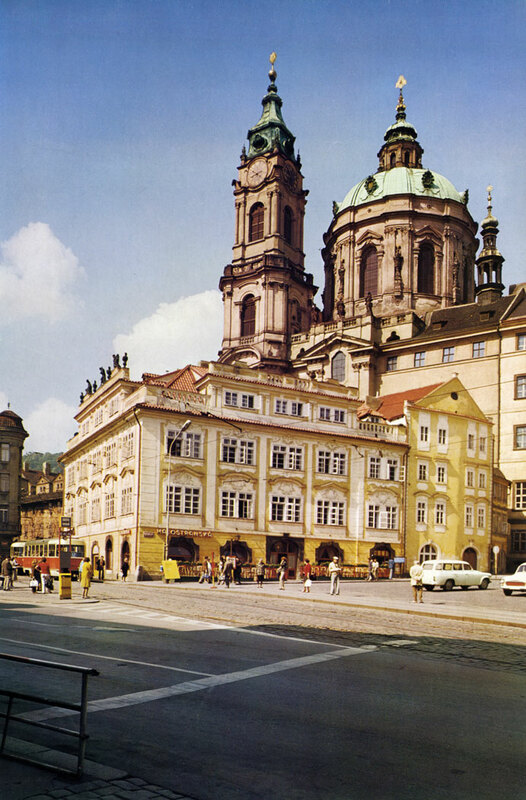 The monastery was founded in 1169, and its territory formed a separately administered enclave even before the foundation of the Lesser Town of Prague. 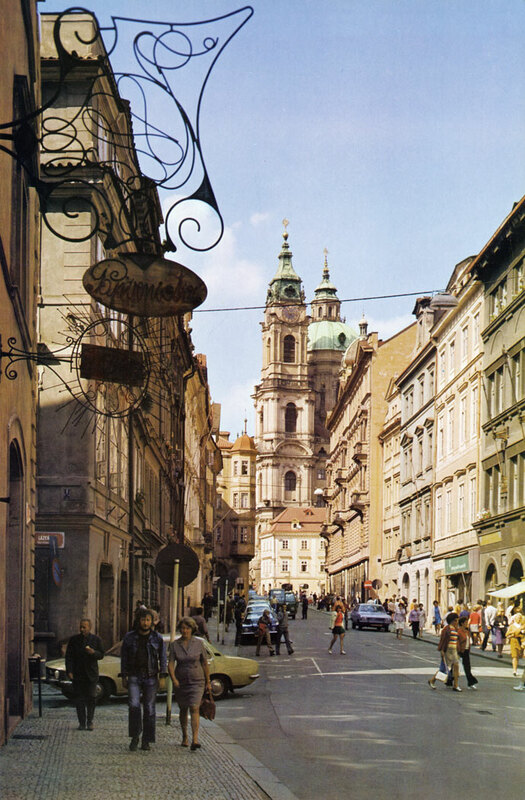 After the middle of the 12th century, when the first stone bridge across the Vltava was built, Bridge Street (Mostecka ulice) became the main line of com­munication in the Little Quarter. 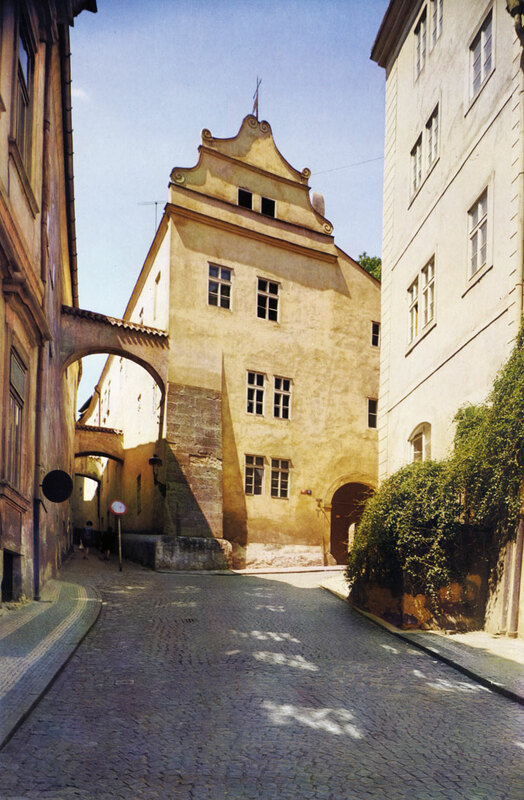 The calm Renais­sance and Baroque facades today reveal little of the many struggles they witnessed in the past, for the last time during the Swedish siege of Prague in 1648. 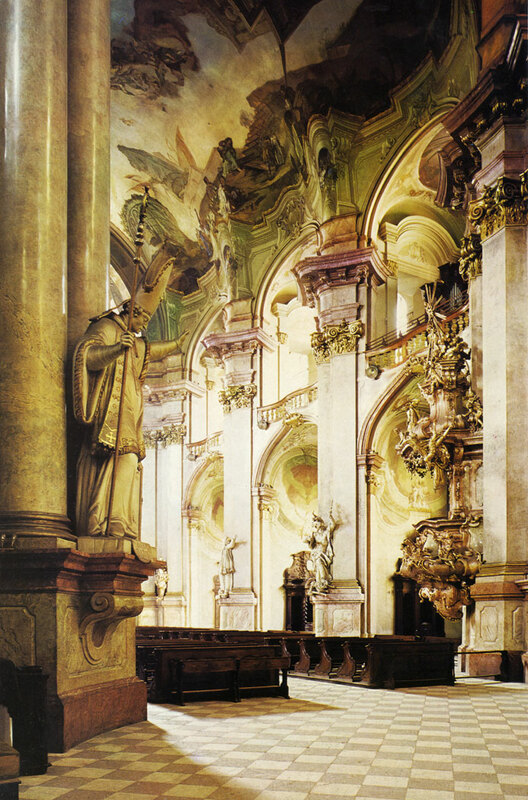 The organ in St. Nicholas's Church was made famous by Wolfgang Amadeus Mozart. It was built by T. Schwarz in 1745. 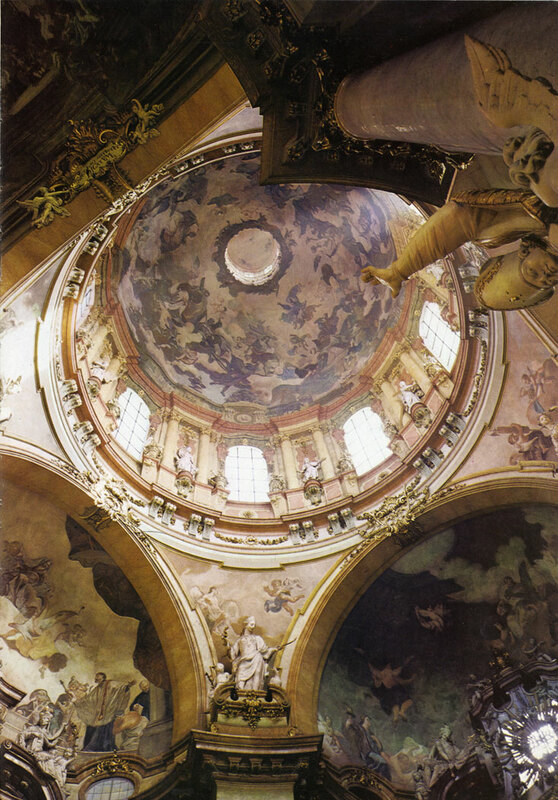 The ceiling frescos with the Glorifi­cation of St. Cecilia were painted by F. X. Palko in around 1760. In the centre of the Little Quarter Square a group of houses closely adjoins the massive St. Nicholas's Church. The house At the Stone Table with the Little Quarter Coffee Hause, which projects strikingly into the Square, was built in 1780. Its plastic Rococo decorations are the work of Ignac Platzer the Elder. St. Nicholas's Church (chram sv. Mikulase) in the Little Quarter, a highlight among ecclesiastical edifi­ces in Baroque style, is the joint work of Christopher and Kilian Dienzenhofer. 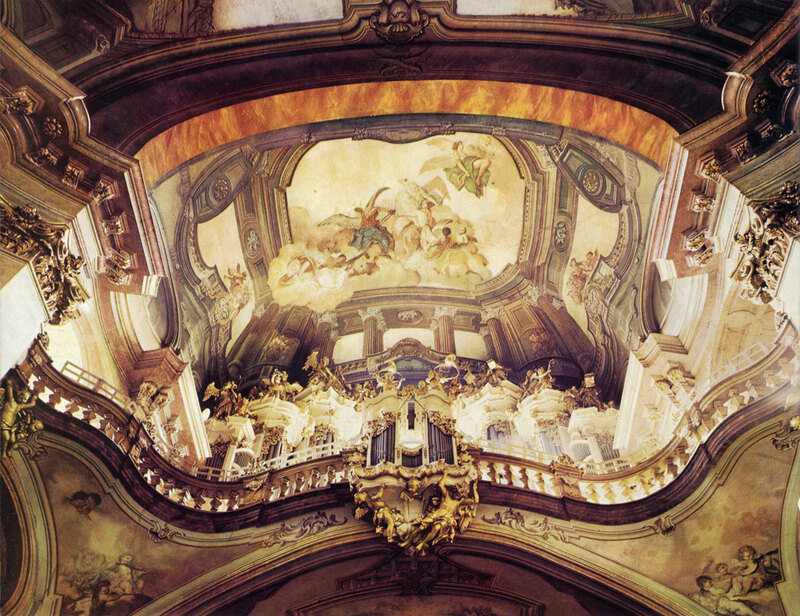 The fagade and the nave were built by Christopher Dienzenhofer in the years 1704-1711, the ceiling frescos depicting the Glorifi­cation of St. Nicholas were painted by J. L. Kracker in 1760. Kilian Ignac Dienzenhofer took over his father's heritage in building the St. Nicholas's church. The monumental presbytery with the dome was built to his plans in the years 1737-1752 and adorned with frescos by F. X. Palko.